The new variant is powered by a 2-litre petrol engine with a total output of 252 horse power. German luxury car maker Audi on Thursday launched petrol variant of its popular SUV, Q5 with price starting at Rs 55.27 lakh (ex-showroom). 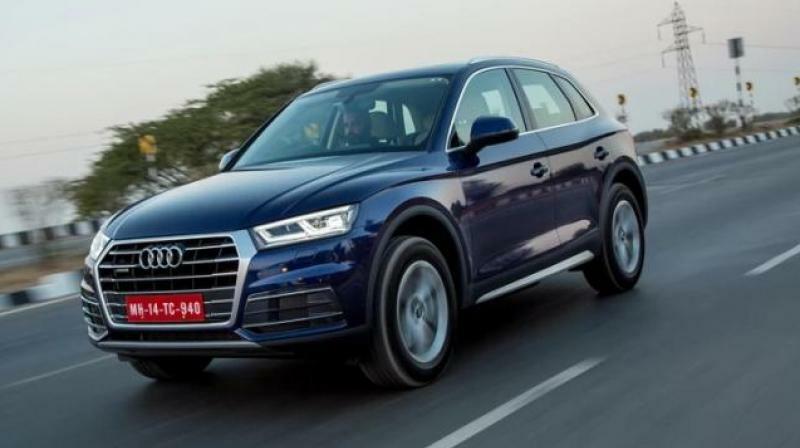 New Delhi: German luxury car maker Audi on Thursday launched petrol variant of its popular SUV, Q5 with price starting at Rs 55.27 lakh (ex-showroom). The new variant is powered by a 2-litre petrol engine with a total output of 252 horse power and is mated with 7-speed transmission. It has a top speed of 237 km/hr and is capable of accelerating from 0-100 km/hr in 6.3 seconds, Audi India said in a statement. Audi India head Rahil Ansari said, "In line with our petrol strategy, we clearly want to increase the contribution of petrol variants in our total sales and with the launch of the Audi Q5 45 TFSI, our entire Q range is now available with petrol options." He further said the Audi Q5 is one of the bestselling models in its class in India and with the launch of the petrol variant, the model will further strengthen its foothold in the Indian market. In January this year, Audi India had launched the diesel variant of the new Q5. "We received over 500 bookings for the all new Audi Q5 TDI (diesel) model within a month of its launch in India, a testimony to its leadership position in the segment," Ansari claimed. The all-wheel drive petrol variant has five driving modes and is equipped with safety features such as eight airbags, anti-lock braking system), electronic brake distribution and electronic stabilisation control system among others, the statement added.